The Lizzie McGuire Movie is a 2003 American teen comedy film released by Walt Disney Pictures on May 2, 2003. The film serves as the finale of the Disney Channel television series of the same name, and was the first theatrical film based on a Disney Channel series. The film stars Hilary Duff, Adam Lamberg, Robert Carradine, Hallie Todd and Jake Thomas, and tells the story of Lizzie's graduation trip to Rome. At its release, the film peaked at number two at the domestic box office behind X2: X-Men United. The Lizzie McGuire Movie was released on August 12, 2003 on VHS and DVD. The film begins as Lizzie McGuire prepares for her junior-high graduation with one of her two closest friends, David "Gordo" Gordon. Her other best friend, Miranda, has chosen to skip the graduation ceremony in favor of a trip to Mexico City to visit relatives. During the ceremony, Lizzie trips onstage and accidentally brings the curtain down on her fellow graduates; this causes her to be teased by her ex-best friend Kate Sanders and her younger brother Matt. After graduation, Lizzie and some of her class embark on a trip to Rome, Italy, chaperoned by their future high school principal, the rude and stern Angela Ungermeyer. To their dismay, Lizzie and Kate are assigned to the same hotel room. Their class visits the Trevi Fountain, where Lizzie is approached by an Italian pop star named Paolo who mistakes her for his singing partner, Isabella. Paolo asks Lizzie to meet him at the fountain the next day, and she feigns illness to sneak away. He explains that he and Isabella are booked for the Italian Music Awards, but she left Italy after their breakup. Paolo tells Lizzie that Isabella lip syncs, and begs her to pose as Isabella for the concert. Lizzie reluctantly agrees but soon begins to enjoy the experience and to fall in love with Paolo. Lizzie continues to fake being ill to prepare for the concert, but Kate quickly figures out her secret. To Lizzie's surprise, Kate agrees to help her and the two become friends again. Meanwhile, Ms. Ungermeyer interrogates the students to learn who has been sneaking out. Gordo takes the blame and is sent back home as punishment. Lizzie is shocked when Kate says that Gordo sacrificed himself to protect her. Back home, Matt browses the Internet and finds Italian gossip sites with pictures of Lizzie as Isabella. When he tells his parents, the family flies to Rome. At the airport Gordo meets Isabella, who is upset that someone is impersonating her. She and Gordo realize that Paolo is planning to have a nervous Lizzie unknowingly sing live at the concert (as Isabella actually does), creating the impression that Isabella is a fake, which would damage Isabella's career and embarrass Lizzie. Gordo and Isabella rush to the concert to stop him. When Lizzie's parents arrive in Rome, Ms. Ungermeyer learns that Lizzie is missing. Ethan reveals that she is performing at the Italian Music Awards, and Lizzie's family and the class also rush to the concert. Backstage, Gordo and Isabella find Lizzie preparing for the show and warn her about Paolo's scheme. Lizzie refuses to believe them at first, but Isabella convinces her that Paolo is using her. Ms. Ungermeyer gets the class (and Lizzie's family) into the concert by pushing through the bouncers. During the performance Isabella and Gordo expose Paolo (who is actually the one who lip syncs) by turning on his microphone, revealing his real voice. Embarrassed, Paolo runs off stage and is ambushed outside by paparazzi. Isabella introduces Lizzie to the crowd, and the two of them sing "What Dreams Are Made Of"; when Isabella leaves the stage, Lizzie finishes the song solo, displaying a newfound confidence. Later, they all celebrate at the hotel's after party, where Ms. Ungermeyer rescinds Gordo's punishment. Lizzie's Parents punish her and grounded her for the summer, but they still love her. Lizzie and Gordo sneak away from the party to go up to the roof, where they promise to never let things change between them. The two kiss and then rejoin the party before they get into more trouble. The film, produced by Stan Rogow, was directed by Jim Fall from a screenplay by Susan Estelle Jansen, Ed Decter and John J. Strauss, was filmed on location in Rome, Italy in the fall of 2002. All the series characters reprised their roles except for Lalaine (Miranda Sanchez), who left the series late in the second season to film the Disney Channel original movie You Wish!. Her character was said to be on vacation with her family in Mexico City. The film had a mixed critical reception based on 98 reviews on Rotten Tomatoes, giving a 41% overall approval rating. The site's consensus stated it was a "harmless piece of fluff that ought to satisfy fans of the TV show". Scott Brown of Entertainment Weekly gave the film a B+: "Let's face it: Lizzie McGuire (Hilary Duff) is just too darn polished to be a junior-high underdog, even by the standards of her 'luxe suburban environs'. But that hasn't tarnished her comeback-kid cred among the six-and-ups who faithfully follow her Disney Channel show—and it doesn't make The Lizzie McGuire Movie, a clever, agreeably weightless theatrical outing, any less enjoyable." Conversely, Roger Ebert gave the film two stars out of four, but praised Borstein's performance, calling her work "the only really delightful element in the movie; everything else is simply slick and professional." In its opening weekend the film grossed $17,338,755 in 2,825 theaters in the United States and Canada, ranking second behind X2: X-Men United. By the end of its run, The Lizzie McGuire Movie grossed $42,734,455 domestically and $12,800,000 internationally for a worldwide total of $55,534,455. (2003) Lizzie McGuire Total Party! The Lizzie McGuire Movie's soundtrack was released on April 22, 2003. It is composed primarily of songs from (or inspired by) the film, including Hilary Duff's "Why Not" and her sister Haylie's "Girl in the Band". "Why Not" was released as a single outside the United States on June 23, 2003 and later included on Hilary Duff's second album, Metamorphosis (with different lyrics in the first verse). The album has been certified platinum by the CRIA, and 2x platinum by the RIAA for selling 2,000,000 copies in the U.S. 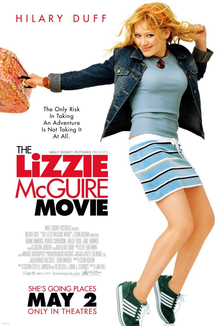 Following the film, there were plans to continue the Lizzie McGuire series, one of which included a planned sequel film. Nothing came to this due to creative difference with Duff and Disney. ^ "Raise Your Voice". Box Office Prophets. Retrieved October 27, 2016. ^ a b "The Lizzie McGuire Movie (2003)". Box Office Mojo. Retrieved 2011-08-06. ^ "The Lizzie McGuire Movie". Turner Classic Movies. Atlanta: Turner Broadcasting System (Time Warner). Retrieved July 10, 2017. ^ "Yahoo! Movies". Retrieved November 23, 2007. ^ "The Lizzie Mcguire Movie At Hollywood Teen Movies". Hollywoodteenmovies.com. Retrieved 2011-11-02. ^ "The Lizzie McGuire Movie". Premiere.com. Archived from the original on 2009-08-12. Retrieved 2011-11-02. ^ "The Lizzie McGuire Movie". Rotten Tomatoes. Retrieved 2011-11-02. ^ Scott Brown (2003-05-09). "The Lizzie McGuire Movie Review | Movie Reviews and News". EW.com. Retrieved 2011-11-02. ^ "The Lizzie Mcguire Movie Review (2003)". RogerEbert.com. May 2, 2003. Retrieved August 14, 2015. ^ "The Lizzie McGuire Movie: Various Artists: Music". Amazon.com. Retrieved 2011-11-02. ^ "Gold & Platinum Certification – August 2003". Canadian Recording Industry Association. Archived from the original on 2010-10-19. Retrieved 2010-08-21. ^ a b "The Lizzie McGuire Movie Chart History". AllMusic. Retrieved March 28, 2007. ^ "Hilary Duff chart history". mariah-charts. Retrieved March 28, 2007. ^ "Platinum Lizzie McGuire Soundtrack". Billboard. Retrieved February 23, 2018. ^ "Cable TV talk". Retrieved December 10, 2018.